The answer to the tie-breaker question in the SCM Christmas Quiz was Alexander. 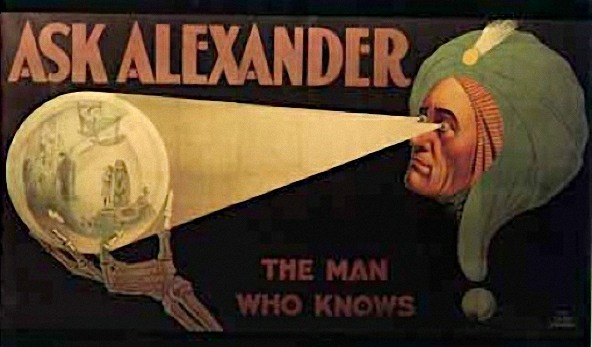 Billed as ‘The Man Who Knows’ Alexander’s real name was Claude Alexander Conlin. Born in 1880, he died in 1954. Conlin did a standard oriental style magic act in the first half of his show, dressed in a turban and robes. But what the audiences flocked to his show for was the second half, a Q&A act where he appeared to divine and answer questions written on folded slips of paper. He was certainly a con-man, arrested many times for fraud and blackmail, and was reputedly involved in bootlegging, opium dealing, even the white slave trade, and admitted to killing four men. Despite all this he made millions of dollars at the height of his career and numbered Clara Bow and Rudolph Valentino among his many show-biz friends. How unlike the home life of our own dear… (insert name of your favourite tv magician). His iconic poster is reproduced in the heading of this blog, along with Thurston, Kellar and Houdini, with whom he feuded on several occasions.